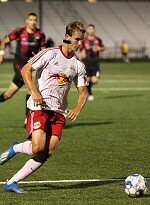 The New York Red Bulls II claimed its first victory all-time against Ottawa Fury FC in a 1-0 win at MSU Soccer Park. The Red Bulls II took the lead in the ninth minute as a deflected pass by Jose Aguinaga fell kindly for Jared Stroud, who slotted a low finish past Fury goalkeeper Maxime Crepeau. New York went close to doubling its advantage 10 minutes later as Ethan Kutler fired a powerful shot that was saved by Crepeau in the top-right corner. Crepeau made another good save after a clever build-up set up Kutler for a powerful from the top-right corner of the penalty area soon after. Fury FC was reduced to 10 men in the 54th minute when Eddie Edward was sent off for a handball that denied Stroud a goal.t Crepeau made a diving save to keep out Anatole Abang's penalty kick to the left corner to keep the visitors within a goal. New York then had back-to-back chances as Aguinaga hit the crossbar and Andrew Tinari had a low shot smothered by Crepeau. Despite late pressure by the Fury, the early goal by Stroud held up as the winner as the Red Bulls II held on for its 10th home win of the season.